Mum set to represent her country in full medieval combat tournament in Gloucester. 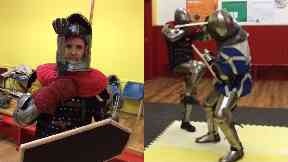 A mum is to compete in full medieval combat after becoming Scotland's first female knight. Leonie Leaver took up the sport after watching a tournament last year and will now represent her country at a major event in Gloucester. She was inspired to take up the sport after her partner took her to watch the International Medieval Combat Federation's World Championship at Scone Palace last year. Leonie said: "In all honesty thought I was going to be bored and I actually really loved it. The whole full contact was such a refresher for me. "I played ice hockey in the past and you're restricted and put in the penalty box, but this was just absolute freehold. "When you first start you are a little bit dubious and you quickly realise you can be hit very hard and your armour is there to do a job, and it does its job." She worked two jobs back to back for three months to get the money to buy her own set of armour, costing almost £2000. Add that commitment to twice-weekly training sessions and looking after her seven-year-old daughter and that gives an indication of how much she loves medieval combat. Leonie's training partner Joe Partridge said: "Leonie's dedication to the sport is incredible, she has put in a huge amount of effort into the sport. "She has hit every session she has never missed a session with me and the sport team, and I don't think she ever will to be honest." The sport is almost unknown in Scotland but is starting to get some attention. With a massive following in Eastern Europe it's far from the sort of re-enactment you might see at castles throughout the UK. It is full contact, no holds barred and not for the faint-hearted. As Leonie gets ready to represent her country on Saturday in Gloucester she has hopes she won't be the only female knight in Scotland for long. She added: "I'd love for this sport to be fully recognised as a sport in this country. So many people are put off because we do not have the funding, finance and recognition. "I would love to go to Medieval Combat Federation's World Championship and be proud to represent my country, and proud to take a team of ladies and say, yes we did this." Leonie is already inspiring her own daughter who comes to some of her training sessions with her on occasion. She added: "My little girl absolutely loves it. On the odd occasion I can't get a babysitter she actually comes to training with me. "The guys are brilliant and get down on hands and knees to her height and give her a padded shield and sword and show her strikes and techniques. "She loves it, she thinks it's just like being like mummy."